Check out these interactive games for the upcoming film Let Me In. The games use actual footage from the film to immerse players in the dark world of Abby, a 12-year old vampire responsible for a series of grisly murders in a wintry New Mexico town. 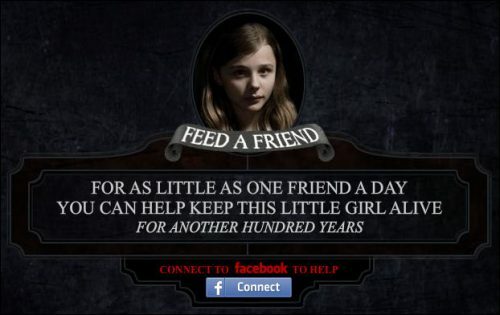 Facebook users can feed a little girl and help her live for another hundred years with the “Feed a Friend” game for Facebook. But when they sign into Facebook Connect and select one of their friends, their seemingly good deed quickly turns deadly and they are shown a series of newspaper stories featuring their friend’s face and chronicling their demise. For iPhone/iPod users, players are in a race against the clock as they solve a collection of word scrambler puzzles. If time elapses before they correctly identify all of the words, they’re treated to a first-hand view of what it’s like to become one of Abby’s victims.